SAN DIEGO — “Bold,” “iconic” and “breathtaking” were words used by San Diego Unified Port Commission members to describe USS Midway aircraft carrier museum’s proposal of a $68 million park on Navy Pier that would include a skyscraper-size 500-foot sculpture towering over the bay. Dubbed “Wings of Freedom,” the massive sail- or wing-like structure would be erected at the end of Navy Pier, adjacent to Midway, where plans are in the works to build a 5-acre park above the existing parking lot. It would house the sculpture and provide a new home for the San Diego Symphony’s summer Pops concert series. While the current layout of Navy Pier includes 350 parking spaces and a 50,000-square-foot abandoned Navy building, the museum’s lease agreement with the San Diego Unified Port District and the Coastal Development Permit both stipulate that a park is to be built on the pier to mitigate the loss of bay views due to the aircraft carrier’s arrival. But McLaughlin and partners — Hal Sadler of Tucker Sadler Architects and Burnham — believe there’s an opportunity for more than just a park at the pier. The group plans to integrate what it calls “Veterans Park” into the promenade and wrap around USS Midway to the nearby Tuna Harbor Park, creating a continuous greenbelt around the famous aircraft carrier museum. The group developed nine variations on the park design — ranging from a $7.8 million park and pavilion option to a $74.5 million option that would include an iconic bridge-like structure spanning the length of the pier. At the Nov. 8 meeting, the group presented the “Wings of Freedom” project to the Board of Port Commissioners as its preferred plan. “We would like to slick the entire pier, take the building at the end that blocks views of the Midway, and demolish it,” McLaughlin said. With the creation of a second level for the park and the demolition of the old Navy building, McLaughlin said the 350 parking spaces on the pier level could be expanded to around 500 spaces — an asset to neighboring projects along the Embarcadero that will require parking for future plans. The end of the pier is where the iconic wings — or sails — would go, with the possibility of a symphony bowl to be placed in between the structures, overlooking the bayfront. The sculpture, developed by Malcolm Leland, would include one 500- and one 400-foot-high wing, built of titanium panels with a reinforced steel structure that would reflect light in the day and include illumination at night. With the current construction cost estimate at $68 million, raising funds for the project could hamper progress — however, McLaughlin reported that philanthropist Denny Sanford has already agreed in principle to make a gift of $35 million to underwrite the iconic “Wings of Freedom.” A source for the remaining $33 million needed for the project has yet to be identified, but it could come from contributions from the San Diego Symphony and Navy Pier parking revenue. 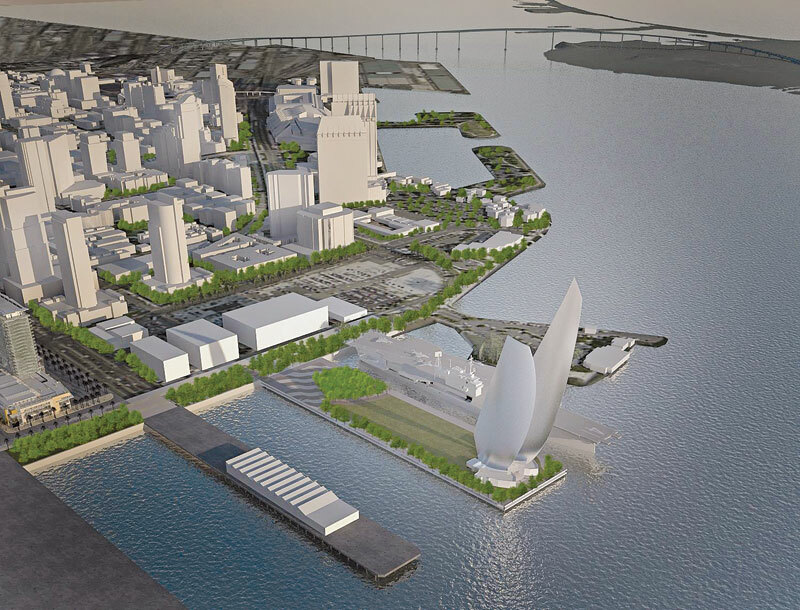 Since March, USS Midway Museum representatives have been attending Citizens’ Advisory Committee meetings to discuss the North Embarcadero Port Master Plan, and they have presented plans for the park at the meetings. But according to Diane Coombs of the nonprofit Citizens Coordinate for Century 3, the group did not clarify which plan would be presented to the port commissioners or ask for a consensus from the group. The Nov. 8 presentation of the park plan did not include any board action. The USS Midway Museum officials are planning to hold three public outreach sessions: from 5:30-7:30 p.m. Nov. 29, 5:30-7:30 p.m. Dec. 6 and 9-11 a.m. Dec. 10 at the Port Administration Building, 3165 Pacific Highway. Despite the lack of action by the board during the presentation, members voiced their approval of the concept — and the boldness of the sculpture. While port commissioners applauded USS Midway Museum for working toward fulfilling its obligations to develop plans for a park, the commissioners requested more information on what stipulations must be met, in terms of waterfront views and developing a second deck on the pier. “I think it’s really important that the port upholds its existing obligations, and I think we need to take a look at that before we move forward,” said Port Commissioner Robert Valderrama. Cory Briggs, attorney for the Navy Broadway Complex Coalition — an environmental citizens’ group — told the port to look at the lease agreement, Coastal Development Permit and Port Master Plan for USS Midway to see what mitigation measures are mentioned. Port Chairman Scott Peters concluded the discussion by adding that the current four-story Navy building on the premises is ugly and blocks views, and saying the development of an iconic structure, extra parking spaces, a 5-acre park and a possible music venue could all be beneficial to the region. For more information on the Veterans Park project, visit veteransparknavypier.com.